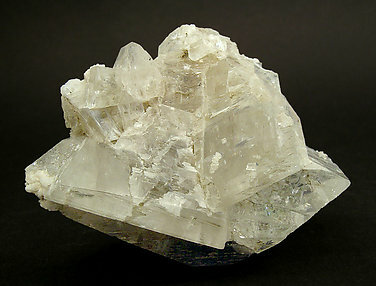 A classic alpine sample (is the variety adularia). A Floater, more clear than usual with a very intense vitreous luster. 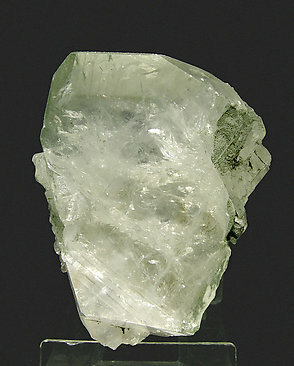 The crystal is considerably transparent and has very well defined faces and edges. 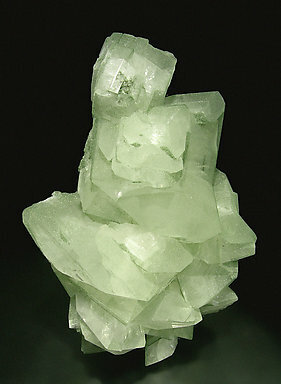 It is only partially covered by Chlorite. The specimen is noted as purchased in 1949 and it is with a manuscript label of Folch we’ll send to the buyer. 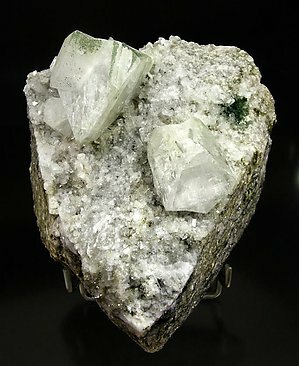 Floater aggregate of very sharp crystals that are translucent white with Chlorite inclusions in some areas and a small Quartz crystal. A Swiss classic of very good quality. 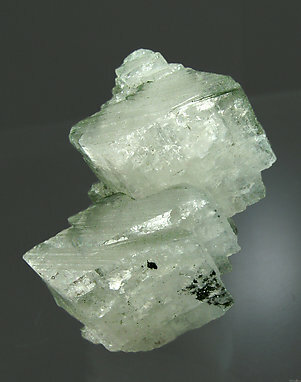 Manebach twin of two crystals with selective inclusions of Chlorite: some of the faces have the inclusions while others are completely free of them. 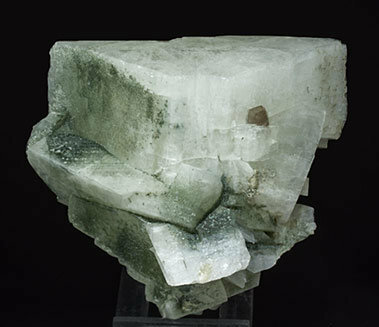 Parallel growths of Orthoclase (variety adularia) crystals that are very bright, translucent, have very well defined faces and edges and are with oriented growths of dark green Chlorite. A Swiss classic. 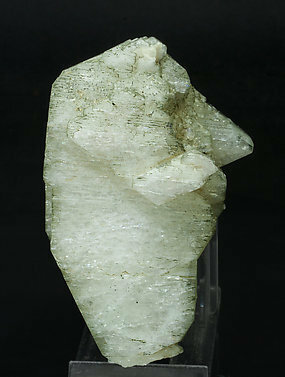 Parallel growth of sharp crystals of very well defined faces and edges, clean, translucent and bright on one of the sides of the sample and with Chlorite inclusions on the opposite. 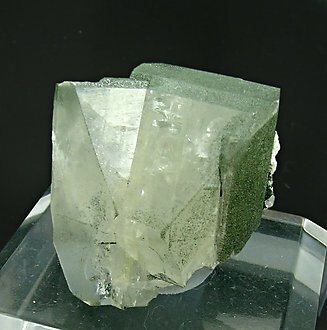 Parallel growths of adularia crystals of tabular appearance, very rich in chlorite inclusions and also with very bright Hematite inclusions. Two very sharp and twinned Orthoclase (variety adularia) crystals, with an excellent color and brilliance, with some inclusions of Clinochlore. 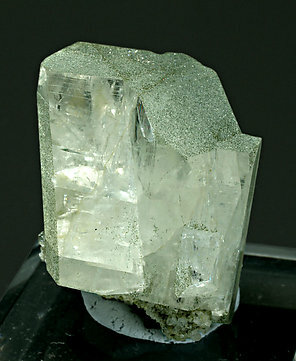 On a matrix covered by small adularia and Quartz crystals. The handwritten Folch label states that it was bought directly from a mountain guide in 1957. 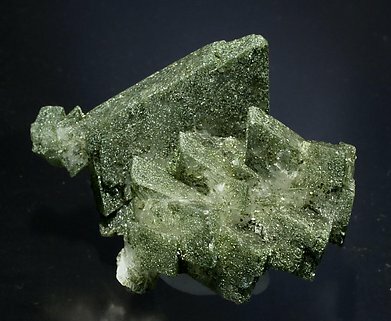 Excellent group of crystals with very sharp faces and edges, partially covered by Chlorite and with very marked Baveno twins. Very esthetic.